'A remake and a hostage picture! Can both the good guys and the bad guys use Sony laptops?' Yes, they can. 95 min. Sony Pictures Releasing. Director: Tony Scott. Cast: Denzel Washington, John Travolta, James Gandolfini, Gbenga Akinnagbe, Brian Haley. Hollywood loves it some hostage drama. From the littlest TV show to big-budget star vehicles, nothing says entertainment like a guy with a gun holding a dozen or so innocent victims and negotiating over a line with an overworked civil servant. In fact, it's quite possible that the only thing Hollywood loves more than hostage dramas is remakes. So when screenwriter Brian Helgeland (L.A. Confidential, Payback) pitched a remake of Joseph Sargent's 1974 thriller The Taking of Pelham One Two Three (or, as the credits would have it, John Godey's novel), Sony could have just plotzed. I can hear them now: "A remake and a hostage picture! Can both the good guys and the bad guys use Sony laptops?" Yes, they can. Yes, folks, this is the sort of picture by which you can set your watch for the moment, midway through the picture, when the bad guy will tell the good guy, "You're just like me." In this case the bad guy is Ryder (John Travolta, turning up the heat from cold-blooded Robert Shaw), a suspiciously money-savvy thug who nevertheless has the sartorial skills of a biker. He's such a nut, by the way, that he uses his real last name (the original film's goons were color-coded Blue, Green, Grey and Brown, one of many ideas to be famously "homaged" by Quentin Tarantino). Anyway, Ryder steals a motorman's cab on a New York City subway line and demands ten million dollars in one hour, or he'll start killing the passengers. "Life is simple now," he tells the motorman (Gary Basaraba). "You just gotta do what I say." In making his demands, Ryder quickly takes to subway dispatcher Walter Garber (Denzel Washington, in the equivalent of the Walter Matthau role). He protests, "I'm just a Civil Service employee," but Ryder intuits there's more going on behind the voice. Turns out Garber is such a superstar dispatcher because he used to run the whole office before being demoted pending an ethics investigation. Here is Helgeland's most interesting innovation; not so much the dead-end detail that Ryder is Catholic (simply to justify a line about the subway car being like a confessional). There's a lot of "1 2 3" countdown suspense: will Ryder's every demand be met before he decides to off one of his "commodities"? Anyone who's ever seen a hostage picture will know pretty much how all of this is going to go down: some people have to die to keep the threat level high, more will be dramatically saved, and the good guy and bad guy will have to come face to face before the final fade-out. James Gandolfini adds value as a fat-cat mayor who's weary under crisis but snaps back like a rubber band when the storm passes. His Sopranos co-star Michael Rispoli plays Washington's supervisor, John Turturro turns up as the NYPD hostage negotiator, and Luis Guzman plays Travolta's right-hand man. But it all comes down to Travolta and Washington. Both do just fine, though the material is lackluster: Though Ryder never quite coalesces into a believable character, Travolta nicely blends his familiar brand of euphoric crazy ("Hoo hoo baby!") with a tendency to explode into angry rants. Washington cannily works his Everyman skills—he's charmingly out of his depth (indicated by his "what now?" expressions and high-stress stammering), but quickly discovers inner resources the audience already knows he has. Still, Helgeland implicitly and too easily forgives Washington's sins with that only-in-the-movies soul-cleanser: action heroics. Maybe I'm naïve, but I'm thinking NYC's Midtown Rail Control Center doesn't have a wall-size computer screen that colorfully tracks every movement by every subway train and car. But if it weren't there on screen, director Tony Scott wouldn't be able to shoot Washington in front of it. Scott makes iMovies: shiny, glossy improvements on your father's motion picture. Scott takes images like the New York skyline and shifts them unnaturally across the screen (the latest trick in a playbook that has long included the camera whirling in an arc around the protagonist), but his obnoxious stylization can't disguise a tired story with no more reason than Travolta's terrorist: just millions of potential dollars. 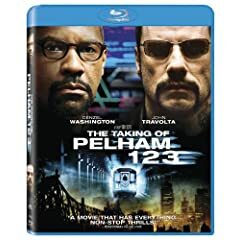 Like the characters in the movie, Sony is not kidding around with its Blu-ray release of The Taking of Pelham 1 2 3. This sweet hi-def edition of the film delivers big time with another technically perfect A/V transfer and a documentary on the film that was good enough to make me want to give the film another try and reconsider its merits. In short, the BD producers are doing their job very well. Scott's film is fast, slick and colorful, and the hi-def picture here captures every bit of flash and dazzle, as well as every nuance of the location photography. The picture's integrity is retained, as light film grain remains, and contrast, detail, black level, and especially textures are awe-inspiring on Blu. Sony has pumped up the Blu-ray with some exclusive features: cinechat, a BD-LIve option enabling instant messaging of new or old friends as you watch the movie; movieIQ, a BD-Live hookup to trivia and info on the cast, crew and music; and a Digital Copy on a second disc. The bonus features package includes commentary with director Tony Scott and commentary with writer Brian Helgeland and producer Todd Black. Not surprisingly, all three make passionate advocates for the film; better yet, they provide quite a bit of background regarding the research and development of the screenplay and the production. Naturally, this includes a discussion about what a remake would have to offer in contrast to the original film, as well as how the new film returns to the source novel. "No Time To Lose: The Making of Pelham 123" (30:25, HD) is an efficient, in-depth look at the film's making, emphasizing Scott's insistence on research, authenticity, and production value. Interviewees include Scott, Black, Helgeland, Denzel Washington, John Travolta, associate producer Don Ferrarone, commanding officer of the NYPD Hostage Negotiation Team Lt. Jack Cambria, John Turturro, Victor Gojcaj, Robert Vataj, M.T.A. New York City Transit director of film and special events Alberteen Anderson, production designer Chris Seagers, executive producer Barry Waldman, RTO supervisor Joseph Grodzinsky, train service supervisor Tony Annarumma, stunt coordinator Chuck Picerni, and associate producer/1st A.D. John Wildermuth. "The Third Rail: New York Underground" (16:15 , HD) puts the focus squarely on the M.T.A. and its world-famous subway system. Reflecting on the importance of the subway to the movie and their lives are Travolta, Anderson, technical advisor Joe Jackson, Black, Grodzinsky, Luis Guzman, Washington, Wildermuth, Scott, Annarumma, Waldman, third rail power man Glenn Tortorella, Seagers, and Ferrarone. "From the Top Down: Styling Hair and Character" (5:17, SD) comes a bit out of left field, but I suppose in the age of the DVD and the Blu-ray, every production "dog" gets his day. Scott waxes enthusiastic about hairstylist Danny Moumdjian of The Lab Salon, who explains his work and contributions to the film. Lastly, "Marketing Pelham" (7:04, HD) collects four trailers for the film prepared by the good folks at New Wave Entertainment. 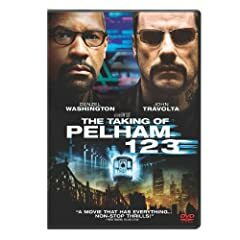 If you liked The Taking of Pelham 1 2 3, this disc is a no-brainer; if you're thinking of seeing the movie, the Blu-ray adds considerable value in its bonus features; and even if you found the film disappointing, the disc could give you a new appreciation for what Scott brought to the material. All site content © 2000-2019 Peter Canavese. Page generated at 04/20/2019 09:18:24PM.